The Canadian and international legal community consistently recognize Gerry as a leading attorney. Gerry leads the firm’s practice areas of bankruptcy, insolvency and corporate restructurings, secured lending, security enforcement and related litigation. He has been involved in virtually every aspect of bankruptcy, insolvency & corporate restructurings. He regularly acts for major banks, asset based lenders, factoring companies and other lenders in virtually every aspect of documenting and enforcing secured transactions. He is also heavily involved in commercial litigation, particularly related to insolvency and security enforcements. 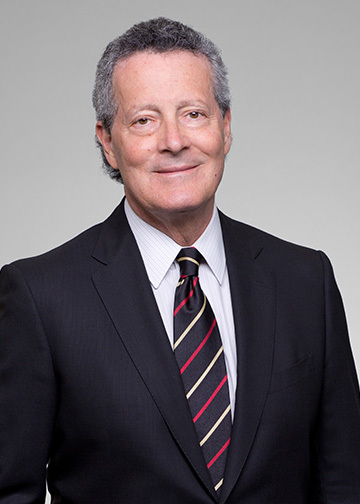 Gerry is a long-time member of the exclusive Insolvency Institute of Canada, having completed two terms as a director and secretary, and is a member of both the American Bankruptcy Institute and Insol International. He is a founding member and past president of the Montréal branch of the Canadian Turnaround Management Association. He is also a past president of The Lord Reading Law Society and has served two terms as Treasurer of the Montréal Bar Association. Gerry was a member of a special committee of the Insolvency Institute of Canada advising the Canadian government’s Minister of Industry, Trade and Commerce on amendments to the Canadian Bankruptcy and Insolvency Act and Canadian Companies’ Creditors Arrangement Act. Represented a major Canadian retailer through its successful insolvency restructuring. Montreal, Maine & Atlantic Canada Co.
Major cross-border insolvency restructuring involving the sale of a railroad in Canada and the United States and settlement of mass-tort claims. Representing the US Chapter 11 Trustee for all matters in Canada. Represented the debtor in possession financier through a major Canadian retailer’s wind-down. Companies’ Creditors Arrangement Act filed by a major group of iron ore mining companies. Represented substantial secured creditor. Bankruptcy of Montréal’s “Bixi” public bike system. Representing major suppliers and the bankruptcy trustee. Insolvency liquidation of a wholesaler and retailer of women’s apparel. Represented the monitor under the Companies’ Creditors Arrangement Act filing and thereafter the receiver. Cross border bankruptcy of a Ponzi scheme. Represented the US bankruptcy trustee/liquidator. Companies’ Creditors Arrangement Act restructuring of a major pulp and paper company. Represented major construction lienholder. Biotechnology company’s insolvency filing. Represented the debtor company through the filing and a complex sale process. Argued the case before the Supreme Court of Canada on behalf of Peoples Department Stores’ bankruptcy trustee leading to the precedent setting decision of that Court establishing the duties of directors of corporations in the “zone of insolvency”. Complex multi-million dollar dispute between two banks arising from fraudulent kiting of electronic transfer items by a common customer. Represented The Bank of Nova Scotia, successful in ultimately obtaining judgment against the Bank of Montréal for the full amount claimed through the Québec Superior Court, the Court of Appeal of Québec and the Supreme Court of Canada (leave denied). Multi-million dollar claim by the Royal Bank of Canada against Regions Bank involving cross-border fraud committed by a common customer (through kiting in multiple bank and factoring accounts). Represented Regions Bank in successfully obtaining complete dismissal of the Royal Bank of Canada’s claim. Billion dollar class action lawsuit by former Canadian General Motors dealers against General Motors Canada and Cassels Brock. Qualified by the Ontario Superior Court of Justice as an expert and testified before that court as to the substance and practice of insolvency law in Canada. Companies’ Creditors Arrangement Act filing by a group of major concrete and infrastructure providers. Represented the Monitor through a successful restructuring.